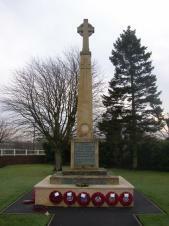 Broughton Astley War Memorial, situated at the junction of Frolesworth Road and Station Road commemorates the residents of Broughton Astley and Sutton in the Elms who were killed or missing in both World War I and World War II. Each year a Service of Remembrance is held to commemorate those who lost their lives in combat. A Role of Honour is maintained in conjunction with St Marys Church and the Royal British Legion.